Many parents will know the joys of being able to park their crawler in a playpen from time to time and know that they’ll stay safe. Puppies need to be protected from many of the same dangers as babies. But there’s someone that needs to be protected from the puppy! And that’s your older dog. Your older dog didn’t choose to get a puppy - you did. His opinion hasn’t been asked. There he is, enjoying his peaceful home, when suddenly a ball of fluff and teeth arrives and he is expected to be an unpaid childminder. Quite soon the pup is ruling the roost. Your faithful older dog is jumped on and chewed mercilessly whenever the pup is awake. If he tells the pup off he gets told off himself. He can’t win. Don’t abandon your old friend! Your first dog needs to know that he is still special and has his own life. And a great way to ensure this is by using the playpen. When it’s time for the pup to wake up and emerge from her crate, you’ll be taking her to the garden, on her own. So once peeing is done, the dogs may like to have a quick game together. Interrupt it as soon as it starts getting rough (even after two minutes if necessary) and divert them to something else - a game with you, perhaps. Now is a good time for the pup to go into her playpen, with loads of things to chew and interact with (cardboard boxes, food toy, soft toys, plastic bottles, chews, bones …) while you get on with your work and Dog no.1 gets a break. And perhaps some personal time with you. The cat is safe from molestation as well, and I don’t have to shriek or grab the puppy to prevent disaster. You can zigzag it and divide a whole room, as I have in the puppy pictures on this page. I found this most useful - my puppy could be loose in the kitchen with me, the adult dogs could enjoy the freedom of going out to the garden or into the house and into the living room, and could see and interact with me. Oh, and if you pop the puppy into her pen when she’s still very young, she’ll never realise that jumping out is an option! You can get great pet playpens cheaply. The one I use is tall enough to be stable if a taller pup stands up with her paws against it. It has a door. It can be any shape from a hexagon to a rectangle or more creative shapes to fit between or around your furniture. It can be used indoors and out. It doubles as a barrier at an open door. My puppy playpen also does service as a “balcony” when we’re camping in the van, so I can have the doors wide open and know the dogs aren't going to fall off a cliff. So it seems strange to me that some people should resist using a playpen for their pup. Some don’t want to spend the (small) money for something they think they’ll only use for a few months. But that is a false economy! It will save you so much bother and moaning at your puppy. Your relationship could be damaged, and for what? I’ve used my playpen extensively even though my youngest “pup” is now 4. It really has paid for itself over and over again. 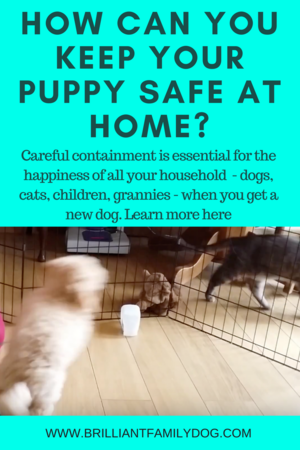 Check out this article for more ideas on containment, with a free guide to download.